Wishful thinking -- might Ting, Virgin America and T-mobile trigger wireless competition? Speaking on a panel at the Geek Wire Summit in Seattle, T-Mobile Chief Marketing Officer Cole Brodman said that bundling subsidized mobile phones “distorts what devices actually cost and it causes OEMs, carriers — everybody to compete on different playing fields.” He went on to say that if he were "king for a day," he would do away with subsidized phones. When asked why T-Mobile did not do it, he said that consumers are used to low phone prices and would not switch even if the long run cost, including usage contact rates, were less. Well, he may be right, but ting.com is betting that if an unbundled plan is cheap and flexible enough, people will be willing to pay big bucks up front for a phone. 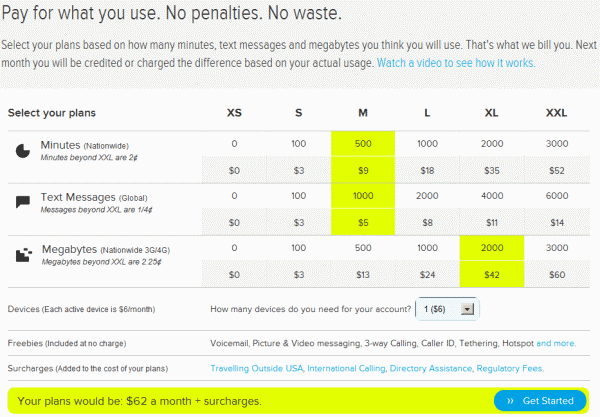 How does, say, $62 per month for 2 phones, 500 voice minutes, 1,000 text messages and a 2 gigs of data sound to you? That is a tentative plan I priced out using Ting's rate calculator (see the image above). But wait, it gets better. There is no contract -- service is month to month. How about their rate plans? There are 216 possibilities. Want more? Ting doesn't roll unused minutes and data over, it gives you cash credit on next month's bill if your actual use is below your plan. What if you exceed the limits of your rate plan? The rate plan is tentative, not hard and fast -- you are bumped up to the next level with not penalty charges. In other words, your bill is a function of your actual usage, not your plan. It's not all rosy. The phones aren't cheap. For example, a Samsung Galaxy SII 4G is $465, but Ting's billing plans and rates can make up for a lost phone subsidy pretty quickly and you won't be tempted to throw away your phone every two years. For the time being, Ting offers only a few phones and you can't bring your own -- you must buy one of theirs. Another possible glitch -- Ting's carrier is Sprint, and they might have poor coverage in your area. Virgin Mobile has launched an ad campaign for their unlimited data service. For $35 a month you get 300 minutes of voice and unlimited 3G data and messaging with no contract. Like Ting, they are on the Sprint network in the US, but their 3G phone selection is less impressive. Might Ting and Virgin Mobile disrupt the mobile phone market? Maybe T-Mobile will jump on the bandwagon. Might we eventually see competition in the mobile market? Stay tuned. The New York Times announced that after 244 years, the Encyclopaedia Britannica is going out of print. Wow, I guess it was inevitable and it probably does not mean much to young folks today, but there was a time when every school and library and many middle class homes had copies of the Britannica. I guess the handwriting was on the wall in the early 1980s, when Grolier, a less prestigous competitor, began offering subscirptions to a text version of their encylopedia through online services Compuserve, Dow Jones, and the New York Times Information Bank. 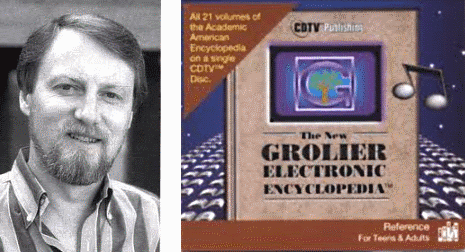 Grolier's next move was a CD-ROM version, which was developed by Gary Kildall, the creator of CP/M, the mainstream PC operating system before MS DOS. Here's a picture of Gary and the encyclopedia. Kildall showed the encyclopedia at the 1985 Consumer Electronics Show and it went on sale the following year. The first edition was text only, with 9 million words and 30,000 entries. It was updated quarterly and pictures were added in 1990. A CD-ROM was faster than Compuserve, but a CD-ROM drive was around $500 in those days. Philips offered a bundle of one of their CD-ROM drives and the encyclopedia. Grolier kept at it for a while, and Microsoft entered the market with their own multimedia CD-ROM encyclopedia, Encarta. Neither of them was a blockbuster, and the Web and Wikipedia finished them off. (I have compiled a collection of Wikipedia evaluations, including a well-known comparison to Britannica that was published by Nature). Now the Net has zapped Britannica too. It brings back nostalgic memories of Britannica set on my bookshelf and the time I was lucky to have spent with Gary Kildall back in those heady days of CP/M and CD-ROMs.